Pictured Gainesville, Florida patient, Jessica Stipe and Dr Peter Gallogly of Gainesville After Hours Clinic. Dr Peter Gallogly a Florida doctor comes under heavy rebuke after he is filmed lambasting patient, Jessica Stipe and refusing to serve her. The state of healthcare. 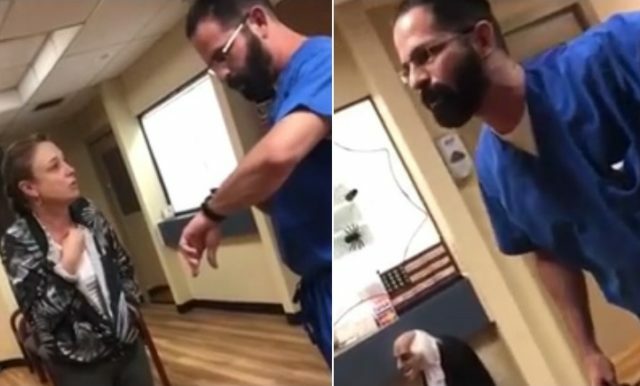 Going viral is a video of a Gainesville, Florida doctor, Dr Peter Gallogly screaming at female patient, Jessica Stipe after the woman complained of being made to wait an extraordinary time after seeking treatment of what she believed to be pneumonia. The exchange caught on cellphone by Stipes’ daughter (see below) came as the ill mother had arrived for a 6.30pm appointment at the Gainesville After Hours Clinic on Monday. Come 7.45pm, Stipe, 38, who had yet to be accommodated by Gallogly, and who by now had ‘thrown up in a trash can,’ sought a refund from the doctor. In turn the ill woman responds she wants to go home and get into bed, which elicits a disparaging ‘telling off’ by Gallogly. Dr Peter Gallogly takes Jessica Stipe’s phone as he is accused of trying to erase video. At this point the daughter points the camera directly to the doctor, asking the irate physician: ‘What’s your name?’ only for Gallogly to aggressively slam the phone out of her hand and confiscating it. Upon the cellphone, an i-phone 7 worth $300 being taken, the daughter demanded her phone back, leading to a scuffle with the daughter being shoved. From there, Stipe claims Gallogly turned down the hallway with her daughter’s phone. Stipe went on to tell via WCJB-TV that she thought Gallogly tried deleting the video before throwing the phone back to her daughter. It was soon after the Jessica Stipe’s encounter with Gallogly was shared on social media leading to an avalanche of criticism of the doctor. 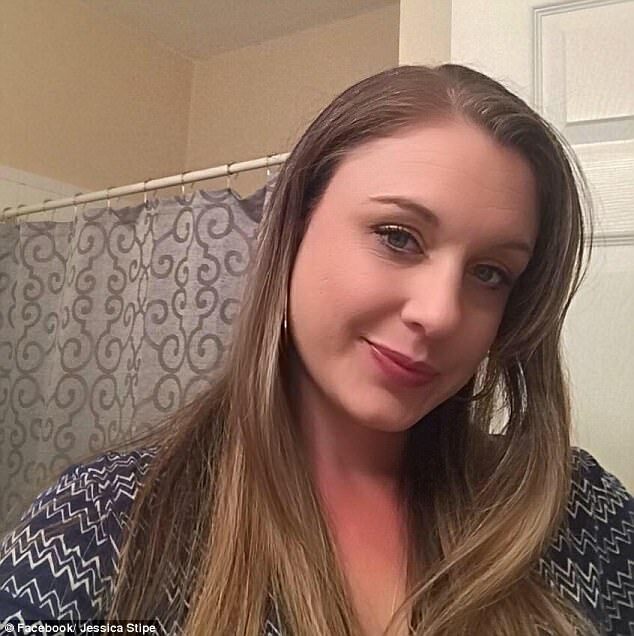 Pictured, Gainesville, Florida woman, Jessica Stipe. A since-deleted page on the Gainesville After-Hours Clinic’s website said Gallogly graduated from the University of Florida College of Medicine in 2001 and completed his residency in family medicine at Alachua General Hospital. In the video the doctor also says that Stipe was seen to and even had a urine sample taken. Gallogly said the situation continued even after Stipe received her refund, however she still would not leave, according to The Gainesville Sun. A follow up police report says the officer who responded to the clinic watched the video and had no reason to believe Gallogly struck or pushed Stipe’s daughter. Stipe said on Facebook: ‘Gpd is here now but says we can’t press assault charges even though it’s all on tape because she has no injury .. wtf .. he took her phone and shoved her she is a minor’. Officer Ben Tobias, a spokesman for the Gainesville Police Department, said a criminal investigation has been launched into Gallogly’s actions. Of note, Dr Peter Gallogly could be face some serious legal trouble since there are multiple statues in Florida state law that say a doctor can’t turn away sick patients under most circumstances. Dr Peter Gallogly and the state of healthcare: The internet weighs in. Wrote Kelly Dunbar, ‘Dr. Gallogly is an excellent doctor with the patience to listen and find out what is going on with you. He and his staff were excellent and got me in and out quickly,’. Followed up with new comments since Monday.